On Saturday, friends honored the memory of “JT”–John Thomas–longtime manager and music promoter of Cha Cha’s of Coney Island and the former Club Atlantis, who died last year. His ashes were scattered off Steeplechase Pier for the second time and the band Neptune Jam played a tribute. Our theory on the upcoming gentrification of the Boardwalk is that it’s the City’s first step toward making the neighborhood attractive to the type of people who might buy the condos slated to be built in the future. The rezoning plan approved by the City Council in 2009 put 26 high-rise residential towers and 5,000 new units of housing in Coney Island, including beachfront condos on Taconic Investment Partners 5.5 blocks of vacant land just west of MCU Park. 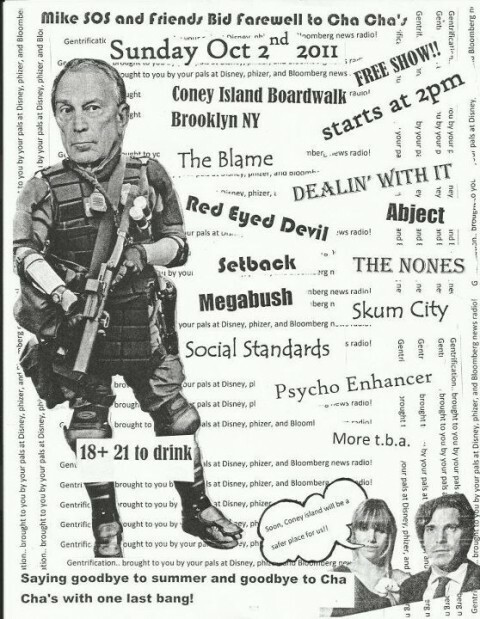 The bands that will be playing at the farewell tribute to good ol’ Cha Cha’s of Coney Island include The Nones, Ritz Riot, Social Standards, Abject, Psycho Enhancer, Dealin’ With It, Red Eyed Devil, Setback, The Blame, Skum City and Megabush. As the promoter Mike SOS says: “Come out and pay your respects to the end of another NYC landmark!” The free show starts at 2pm.